There are around eight thousand Indonesian Citizens (WNI) currently living in Brunei Darussalam. They involve in various fields of works and professions enhancing their experience abroad. This is a challenge for Indonesia Open University (UT) to serve the Indonesians living abroad to earn higher education degree even though they are away from their home country. The spirit of Indonesia independence is strongly sensed and celebrated by WNI overseas. In a bid to celebrate 73rd Anniversary of the Independence of the Republic of Indonesia, the Embassy of the Republic of Indonesia (KBRI) in Brunei Darussalam organized an event of "Pesta Rakyat" or People’s Festival. Wherein, Indonesians or WNI living there gathered to celebrate the Republic of Indonesia’s Independence Day at the Office of the Embassy of the Republic of Indonesia (KBRI) in Brunei Darussalam. This event was held on 19 August 2018. 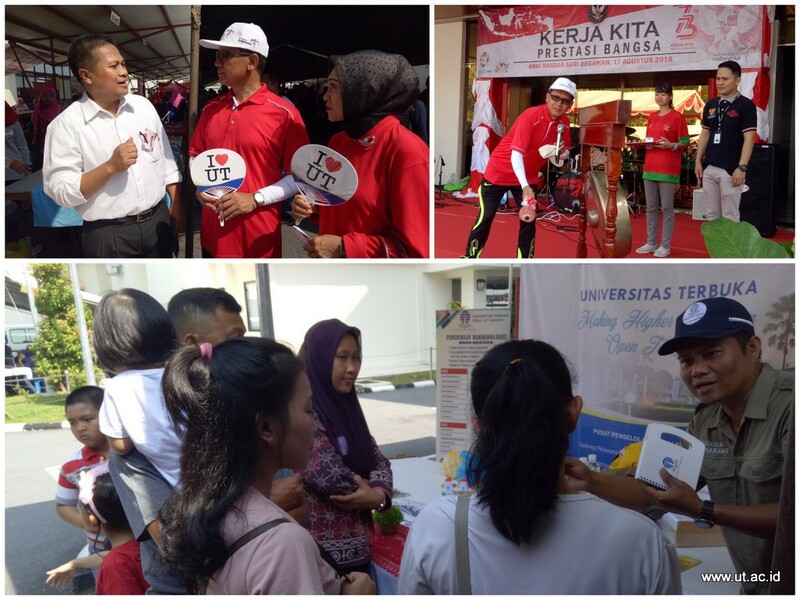 UT was invited by KBRI to take part in this event and to introduce UT to the Indonesians in Brunei Darussalam. Realizing the importance of education as well as concern of Indonesians who live in Brunei Darussalam compels the Indonesian Embassy of KBRI to invite UT to contribute in the socialization of its programs to the Indonesians there. The event, which was officially opened by H.E. Ambassador of the Republic of Indonesia for Brunei Darussalam, Mister Sudjatmiko, MA., was packed and visited by Indonesians in Brunei. In addition to the UT stand, other stands presented Indonesian foods and products. The objectives of this "Pesta Rakyat" are nothing but to continue to nurture the love to our motherland and to cure the homesickness to Indonesia. In addition, it also tightens the brotherhood among the Indonesian migrants in Brunei. While going around the booths, H.E. Ambassador and his wife paid a visit to UT stand. They were warmly welcomed by the attending UT’s team, consisting of Director of UT Tarakan, Officers of BBLBA at the Center for Overseas Student Management or Pusat Pengelolaan Mahasiswa Luar Negeri, Officers of Marketing, the Center for International Relation and Partnership Development or Pusat Pengembangan Hubungan Internasional dan Kemitraan, as well as UT students in Brunei. The number of UT students in Brunei Darussalam reaches up to 15 students. With God’s Permission in 2019.1, there will be another 25 student candidates who will join UT. H.E. Ambassador advised Indonesians to use UT as the place to study and Insya Allah, will socialize UT in various opportunities to Indonesian Citizens or WNI. Thus far, the management was handled by UPBJJ-UT Tarakan. This figure is expected to constantly grow considering the result of the festival as many have asked for more information and would like to pursue their higher education with UT.